This inspired our team to think about the value of our design services as a “local” provider. Thinking Caps Design is known for environmental graphic design. That’s a discipline concerned with the visual aspects of identity, wayfinding and information delivery in man-made environments. We passionately connect people with places. 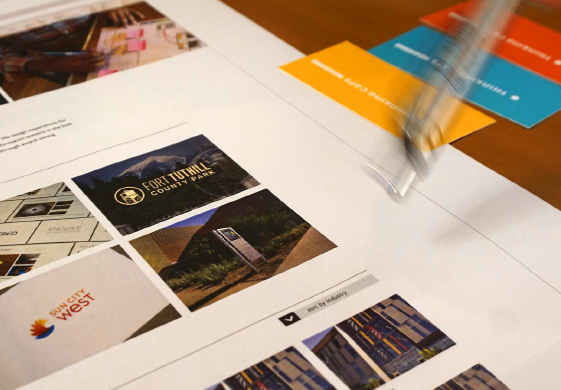 Our team begins many projects by visioning a logo for marketing materials as a foundation before crafting identity and wayfinding signage. So we asked ourselves, “why buy local” for logo design. Supporting a neighborhood retailer or independent restaurateur stimulates your community’s economy and keeps money recirculating as goods and services are purchased from other local companies. This is true for design too. But there are more essential reasons to choose designers that understand your market and community if you are planning for project success. When Thinking Caps Design crafts a logo, it distills the essence of a brand before giving it a visual form. Unlike crowdsourcing, a local design firm can employ an interactive process involving stakeholders in brainstorming to identify a wide array of meaningful options. That was our approach when Sun City West asked us to do a makeover for their iconic brand. Support for the change was galvanized at a community presentation and now a new generation of empty nesters and mature home buyers are discovering the brand all over again via the client’s web, digital and print marketing initiatives. Honoring the traditions that make a place unique can help gain community acceptance for a development project. Local designers are better equipped to capture a sense of place because they are local inhabitants as well. National homebuilder Taylor Morrison planned a residential development on the site of Greasewood Flats a distinctive watering hole that had served the community for four decades. The iconic cowboy-themed eatery was also a popular stop for fun-loving motorcyclists. It sat upon a large parcel of land that had been owned by a prominent family that operated Scottsdale’s first and longest operating blacksmith shop. Thinking Caps Design provided naming and logo design services, christening the new development “IronHorse,” linking its past and present to express the rough and tumble character this landmark once represented. Being part of an architectural design team can play a big role in logo design. Travel back to 1878 when an enterprising entrepreneur built an irrigation canal upon the ruins of canals constructed by an earlier Hohokam civilization. The fertile community that arose near the canal blossomed into Phoenix, Arizona. That Grand Canal now bisects a 58-acre planned multi-use development that will be constructed over the next 20 years. Known as The Grand at Papago Park Center, Thinking Caps Design was chosen to craft a logo and environmental graphics for the culturally significant site. As its architectural centerpiece, the Grand Canal was re-routed to create a spectacular water feature at the heart of the project. With client collaboration, Thinking Caps Design identified three interrelated design themes: water, energy and stewardship. Collectively, these are the essential components of sustaining urban life in the desert. The intimate knowledge of the architectural intent for the project influenced the dynamic logo design of concentric ripples on classic letter form, suggesting expressions of ebb and flow, capture and release, collection and distribution, protection and management, and a systemic view of nature. Change is good, but transformation is better. When it comes to the built environment, there are clear benefits to choosing a local designer over cloud-based services. The interactive experience between stakeholders and designers is essential to receiving a quality product that is true to your architecture and sense of place. By supporting local designers, you transform your community — enriching its creative texture and investing in healthy, long-term growth. Choose wisely. Thinking Caps Design is a proud member of Local First Arizona.